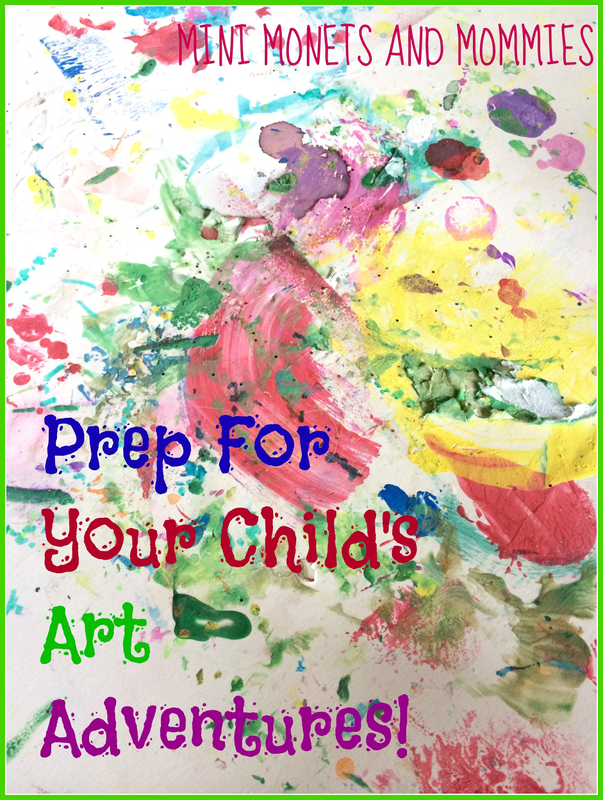 Do you love making art with your kids, but can’t stand the mess? A few years ago I taught a preschool art class called “Make a Mess”. The enrollment in that class surpassed any other- by far. Why? More parents than not told me that they would rather someone else (or someplace else) deal with the mess that painting, printing, paper mache and just about every other project caused. 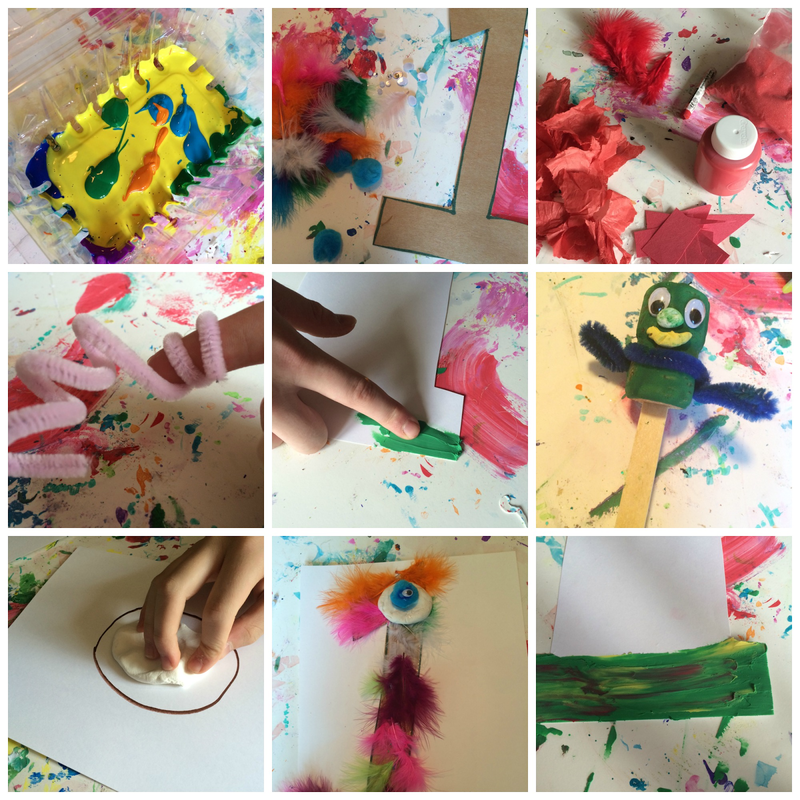 Messy art activities provide ways a-plenty for young children to engage in the creative process, explore through their senses and use their imaginations. The freedom that splashing through a bowl of paper mache paste or smooshing chunky finger paints offers is something that – given the opportunity – many adults would like to experience again too. When else in life can we gleefully squeeze puddles of glue onto paper or splatter temperas around like Jackson Pollock? That said, it isn’t always easy for a busy parent to let go and set up a messy play station at home. While I’m certainly an advocate for this type of activity, as a mom I completely understand that the thought of glitter getting stuck in the floor boards or water colors spilling onto the kitchen table can make any mom cringe. 1. Cover it with a flattened garbage bag. 2. Use cardboard (the side of an old appliance box works well). 3. Buy a super-inexpensive vinyl table cloth to use as a tarp. 4. Use an actual tarp. 5. Get some of that cheap-o one-time use plastic sheeting that home improvement stores sell for house painting projects. 6. Layer newspaper over newspaper. 7. Go outside, where you can easily hose off the mess. 8. Try a shower curtain liner (I suggest using the chemical-free kind). 9. Try a shower curtain. So, if you’re wondering why there are only nine items on the list (wouldn’t 10 be standard? )- here’s why. I’ve saved my favorite for last. Foam core board. It’s thick, with a layer of foam in the middle for absorption and protection and comes in sheets that are large enough to cover a fairly sizable area. I use scraps from other projects to protect my table when crafting. If you’ve been following my posts regularly (and if you haven’t – go ahead and check them out) you’ve probably noticed a running theme. My favorite foam core board is featured in almost every activity. Seriously, check out the photos and you’ll see that it serves as a backdrop for everything from frozen ice paintings to styrofoam letter prints. I believe it made its first appearance in a finger painting post, and has since gotten covered with sparkles, absorbed tissue paper water colors and held its fair share of modeling clay. If an artsy mess is causing you stress, go ahead and try one (or a combo) of these prep ideas. They won’t keep your child’s hands from getting covered with sticky clay or her face from the random paint streak, but that’s what baths are for, right? Are you looking for art activities that encourage exploration? Check out and follow my Pinterest process art board for ideas! Garbage bags are my go-to cover...that and wax paper at each spot for clay or cookie dough projects. We've never tried foam core. I'll keep it in mind. Love your wax paper idea! Great way to help to keep the stickiness off. I used to love doing creative stuff with my two when they were small. We still have the bit box under the bed, where we collected bits and pieces that may come in handy for building that spaceship or reindeer sleigh. As much as I enjoyed the fun part, I dreaded the mess, and invested in a plastic tablecloth just for the purpose. You have offered some good mess minimizing tips, I particularly like the foam core board as that would help mop up any wetness from drips and spillages. Thanks! I've found the foam core board to work the best. I've used the same piece for tons of activities and it really stands up (and keeps the table clean).